Q: What about the grading process? Feedback? What sticks out to you there? MS: I think the real good time to learn was both by watching yourself and watching other guys in the film review session after every game and every practice. Everything you did the day before, you really learned a lot by watching. You’d find out what everyone did right and wrong. At times you got tired of the meetings, but I kind of enjoyed that part. It was cool learning about yourself through viewing other people, so I think that was a vital part for the guys who didn’t even really like it. It was a huge part of player development more than anything. Q: And how long would those meetings last? MS: Probably an hour. Oh yeah, we watched every play from practice and got together before practice, sometimes even a little longer. Q: So for those people out there who would say, “Football players have everything given to them,” how would you respond to the average Joe. MS: Obviously, I was a football player, so there are things associated with that. But I was also a walk-on and had to do some things to stay above water. My college experience wasn’t a big party or anything: it was going to school and playing football, and those are the two things I had time to give 100% toward. For me, I envisioned myself having to give everything I possibly could to make it happen to play football. There were times where I had chemistry lab and would be in class, and instead of eating at the training table I would work out longer and get a sack lunch and eat it at chemistry lab, just so I could feel like I was working out like I should be and get more time in, just doing the extra things on our day off, those kinds of things. Like I said, there are a lot of sacrifices, like working out longer or studying later. With football and school and aspirations of going to med school there wasn’t much time to devote to too much else. It was a sacrifice I didn’t mind making, it really was like two full-time jobs. The day started early and most of the time it didn’t get over until real late. MS: (laughs) Yeah, I would usually scarf something down out in the hallway after a few minutes. Those are just little things I thought I had to do to get me over the top. I had to always outwork the guys below me. I was always motivated by that, to never let anybody jump over me on the depth chart. I always thought I had to outwork them to keep the next guy from doing that, guys that were a little more athletically gifted and talented. I just tried to do everything I could. MS: Yeah, that is very similar. Exactly what it is. If you give that kind of effort and do that, you can feel good about what you did and there is no doubt or no guessing, ‘If I would have done this or done that?’ You lay it all out there. MS: Probably the personal journey. Just having my goal from junior high that I wanted to play football for Nebraska. That might seem kind of crazy, but I started doing things at that age to prepare myself. And then just the whole process of working my way up the ladder in the program and getting to the top and playing at such a high level for the national championship. So there was that whole process. And the whole process of going through college, that there can actually be a ‘student-athlete.’ I was actually First Team Academic All-American my senior year. I remember as a freshman thinking, ‘Those guys who accomplished that were really cool.’ It was something I was really proud of, that I accomplished that. Q: Your portrait’s up on the wall at the Academic Center, isn’t it? Q: Anything you wish you could do over, Matt? 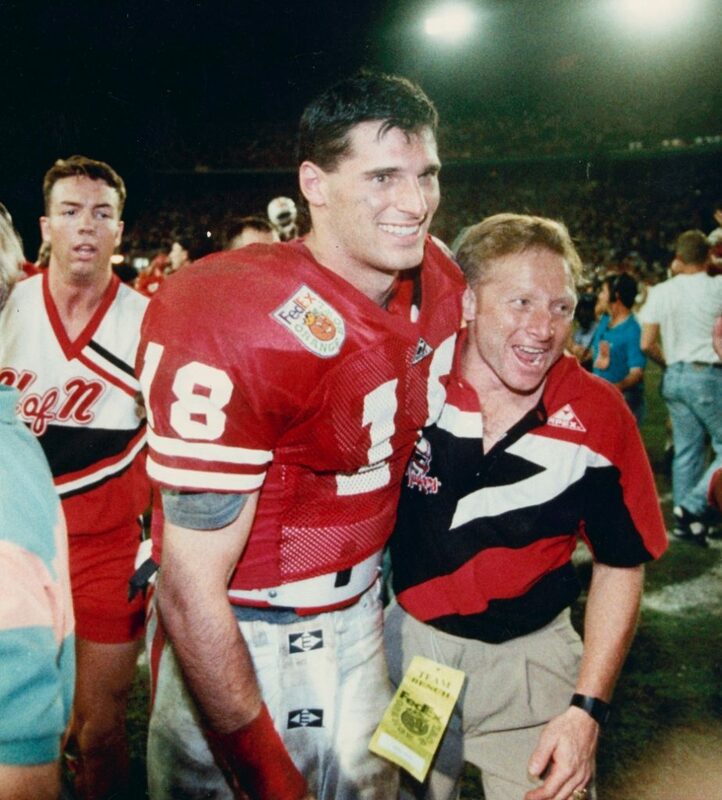 MS: That part of my life, I have a whole calm and peace about everything I did at Nebraska. The effort that got me to where I was, I don’t think I’d change anything. I really don’t. I really don’t know if I could have done anything, worked any harder than I did those five years. That’s just the kind of football player I was. It wasn’t work to me, because I loved every bit of it. I wouldn’t change anything. Q: Let me ask: anything outside of the realm of campus or the football offices that were good team-building experiences? MS: There were fun times playing video games and hanging out. The football video games, those were the times guys would get together and have groups and play game after game after game and talk trash. They were fun times spent together. On road trips we’d bring them to different locations and be playing. It was some fun down-time where we were also competing, so it was pretty cool. Q: You wound up earning a scholarship, right? MS: Yeah, my senior year. I contributed a lot as a junior, but they cut back scholarships. And when you struggle as a walk-on and see yourself playing -and playing quite a bit- and some scholarship guys weren’t playing, sometimes you’re like, ‘It doesn’t seem all that fair,’ but it is what it is. Just the number of scholarships, it was the second or third game of the year and I was the starting tight end, and I got the scholarship. 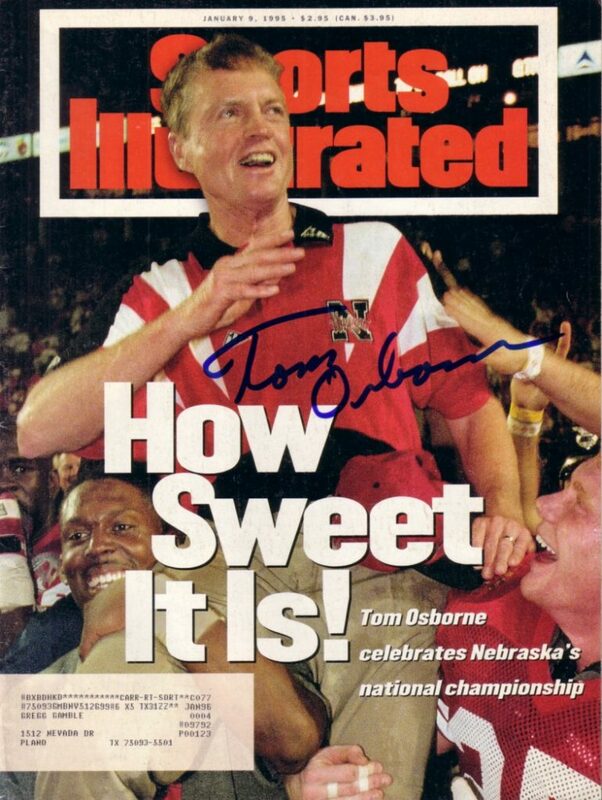 I remember getting called up to Coach Osborne’s office -and he talked to me like a week or so before, trying to work something out- and I remember telling him that, ‘whatever happens, happens. I’m just having the time of my life. We’re rated high in the polls and I’m starting.’ I really wasn’t all that worried about it. But it opened up, and it was a cool day. Q: So you’re an anesthesiologist now? How did that happen? MS: I always liked science and those type of things, and when I was at UNL I always had aspirations to do something with biology. It was a good fit for me and a good choice for me. It’s a combination of procedures, and the science behind that is really interesting. You don’t talk to a lot of patients most of the time, because most of the time they are asleep. (laughs) That was always intriguing, too. MS: It’s very brief. (laughs) Most of the time you’re taking care of them when they are unconscious. I found during rotations that all the problems and all the talking really wore me out, and I was really drawn to the concept of taking care of the patient: ‘How do I help your blood pressure? How do I help this or that?’ It’s kind of like you’re their guardian angel, taking care of them while they are under anesthesia. It’s a role I like. Q: Who behind the scenes meant something special to you? MS: I’d probably give that award to Bryan Bailey. 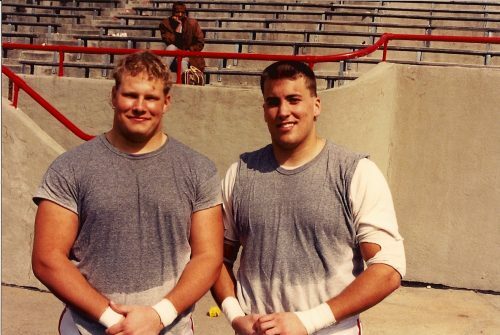 He was just kind of there all the time as a strength coach, a mentor. He always had a very challenging take on a lot of training regimens and had interesting things to try, innovative ideas, motivating and pushing you. If you had a question or weakness, I think he was just a great personality to have in the strength and conditioning program. And I think he bonded with the guys. A lot of guys would probably give Bryan Bailey pretty high marks. And Keith Zimmer, I can see how he was instrumental in a ton of things, too, with a lot of guys. I was pretty okay in that area, I really liked Keith and Dennis (Leblanc). I just talked to them today, actually. But Bailey, I think he was super-instrumental. And the trainers, Doak and those guys were excellent as well, but knock on wood, I was a guy who was pretty immune to a lot of injury and didn’t get hurt very much. Q: Didn’t get to know them as well as some? MS: I was more of the casual visitor of them. I had a few bumps and bruises. Some guys went through some major rehab and have different impressions, but the training part I was always into and fascinated with, and I always thought Bryan Bailey had lot of really good ideas. Some guys thought he was crazy, but he always seemed to want to make you do more. Sometimes I thought he was crazy, but I’d think, ‘this guy has a point here.’ He just made me want to be more and do more with his crazy regimens. He’d have us run through the hurdles and these big cement drainage pipes and jumping fences. Different, crazy stuff. I don’t even think Boyd knew he was doing some of that stuff. 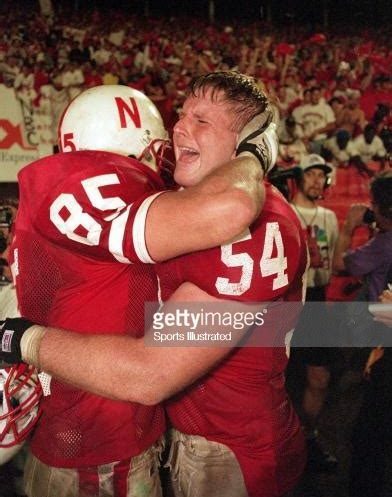 (laughs) And he’d even take us to the Devaney Sports Center pool and have us do some crazy exercises, but he was a huge guy as far as my thoughts go. He was so good. I just wish he would have gotten his just rewards and he would have been a really good head of the program for a lot of years the time he was the head guy. But things happen for a reason. Q: Anybody else worth commenting on? MS: Lawrence (Phillips) wasn’t that bad a guy. I mean, he had problems, a couple of fights, but as a football player he worked really hard. He seemed to be a pretty team-oriented guy, worked hard and wasn’t a real vocal guy, just did things quietly. I don’t have anything really bad to say about Lawrence. Maybe he was kind of a product of his past. And a lot of people overcome their bad past but not everybody does, you know? Me, growing up with both parents, a loving home, brothers, I was never in any other environment as a child, so I think it would be pretty hypocritical to be too hard on him. The path he had to walk, he had a rough time with things. It’s kind of sad the way things ended up with him. 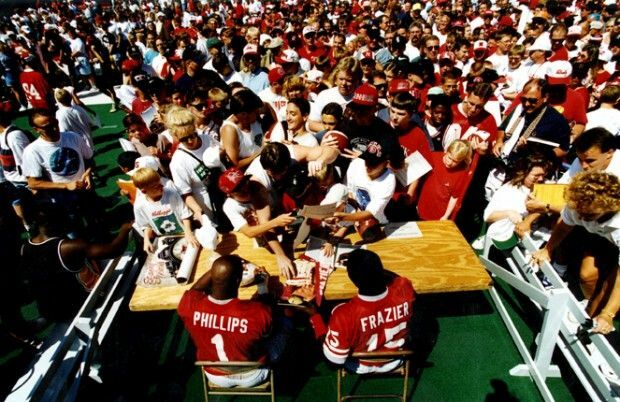 I don’t think Lawrence Phillips is necessarily an evil person, I just think he had a lot of bad spells and made some poor decisions. He has some issues to work out, I just wish him the best. He was a great teammate with us. Now, this is the ’94 perspective. Maybe the ’95 team’s perspective may be different, but he was a tremendous workhorse and wasn’t a detriment to the team. Coach Osborne was just trying to help the guy out. Not one part of me thinks he did it to help the football team. What the media said, I don’t believe it at all. I think he was just trying to treat him as one of his sons and help him out. Lawrence kind of blew it, but the intentions were pure. MS: Well, we just had the right mix of character -as well as characters- together, and everybody gave a selfless effort. That’s why we were so good. We had talent, but it was the selfless effort: our secret weapon. Because a lot of teams out there had a lot more draft choices than we had. So if there is an intangible, it wasn’t that we thought of ourselves, but we thought of the guy next to us a lot more than ourselves. Q: How did you meet your wife? MS: Through classes at Nebraska together. With football I didn’t really have time to devote to more than two causes in that short period of time. And we knew each other, but we really didn’t start dating until after the Orange Bowl. I was pretty devoted to the first two causes for most of my college career. I’d go out and stuff, but for the most part I was very focused on the first two. Q: After that last football game, was there difficulty in letting football go? MS: Yeah, I think everybody has a tough time with that. I think that’s a part of everybody’s life, especially major college athletics. It’s a bit of an adjustment period, getting out of that whole mentality. There’s so much fun and so much unity: we’d eat, drink, lift weights, train, everything with these guys, and then it’s just gone. You’re kind of lost for a bit. I know a lot of my ex-teammates went through some of that, and some guys are now going through even different phases of that, the NFL guys. Matt mentioned, “I just remember being totally focused, never really nervous. ..Even though we were in a hostile environment we just all had total, complete faith in the guy next to us.” Perhaps I’m reaching here and sensing more than meets the eye, but after hearing a few comments of this kind I am beginning to think that a key to the great 60 & 3 run was every player’s confidence in knowing there was absolutely no need to second-guess teammates’ ability to properly and effectively perform their assigned tasks every play call. Rather than averting attention to ensure the mission was going as planned, they were able to maintain complete and total focus on their own personal task and that task only. I’m convinced of it, especially after some of the guys have mentioned they don’t have a special play they remember from all the snaps played. Sometimes it so happens that you are so fully and completely focused on a task, so involved and in your zone that you are able to block out other inconsequential issues and external demands from garnering your attention. I have a feeling that this kind of focus actually led some to some type of shutting down in the memory-recordation part of their brain in these situations. Call me crazy, but I think I’m onto something here. Then there was his, “He’d always teach us …in a very encouraging way. You might have just gotten smoked by a guy, but he wouldn’t make you feel like a total failure. He just had a way of encouraging you that you’d want to do better…” I call this ‘Tom Osborne’s 3 to 1 Coaching Principle,’ whereby there are three conversations praising/building up an individual (constructive communications) compared to the one time you admonish or deliver ‘negative’ or corrective feedback. In Coach Osborne’s 1996 book, On Solid Ground, he writes, “To me, coaching consists of catching a player doing something right and reinforcing that behavior… So many coaches see “coaching” as telling players what they are doing wrong. Telling them they are doing something right is even more important.” To put such a coaching ideology into practice is not for the lazy, unattentive or weak of heart, because it requires extreme vigilance, especially when a program involves the participation of 150-plus student-athletes. 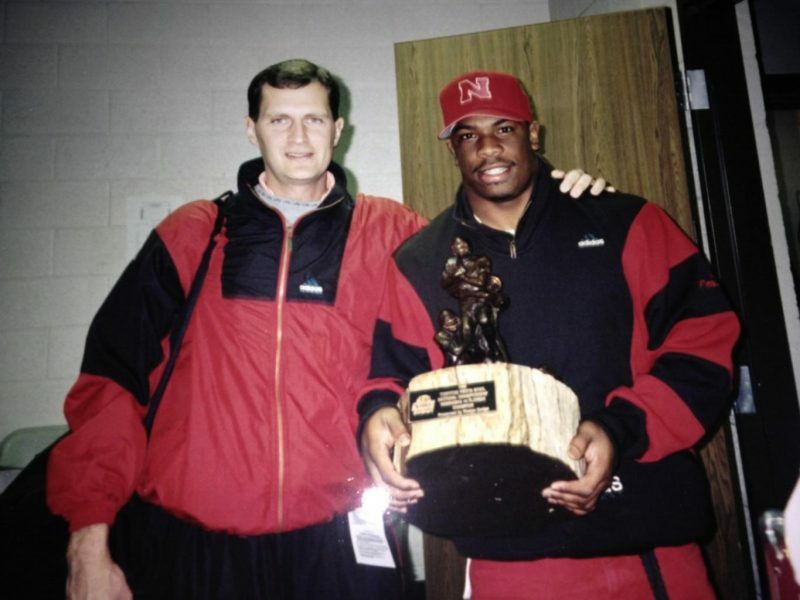 To his credit, I can honestly say that many times I’d witnessed Coach Osborne critiquing a player’s weight lifting technique in the strength complex after a practice, a fact that I found mightily impressive. Many a coach rarely sets foot in that environment, busying himself with more CEO-like functions instead, but Tom and his assistants found a way to use those moments as opportunities to encourage, to engage, to exhort, to compliment and build further bonds of trust and unity. One could say that confidence and trust –essential to any highly successful team- are built one ‘pat on the back’ at a time. Next, (and I think this is a huge one) we had Matt’s opining that, “…we just had superior character on that team. My class saw the extreme ends of how things could be. Philosophy will only take you so far, but you’ve got to get guys that care for each other and be willing to take it to the next level. I think character was the big thing.” Hearkening back to Professor R. Scott Clark’s mention of virtue a few chapters previous, the outgrowth of such virtues results in the concept of character. Rather than preach or expound upon the notion here, I believe most every conversation you’ve read up to now has been a slow reveal of the true character of the vast majority of young men from those years, aside from an extremely few who exhibited rare lapses in judgement in that time. Many a fool paints his subject matter’s canvas with too broad a brush, and the same metaphor would serve us well when it comes to reflecting on the totality of the 60 & 3 era’s individuals who made up that mosaic. In his book The Quest for Character, noted Pastor John MacArthur once penned, “Character. It has an old-fashioned sound to it, like a faded relic of the Victorian era. We live in a materialistic culture where prestige, prosperity and popularity are valued more than genuine integrity. 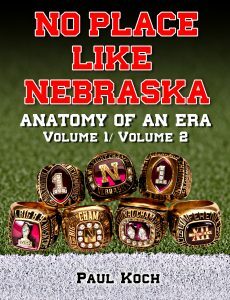 In fact, personal character hardly seems to matter very much at all nowadays…” I would agree but for a special group of talents, achievers, walk-ons and misfits in that incredible Nebraska Football era who rose above societal norm to accomplish something special, memorable and lasting. They were characters with character.